Please take a moment to come follow me at my new home... I'm Still Standing, I hope to inspire you on a daily basis for all things that relate to design and raising a daughter with special needs. 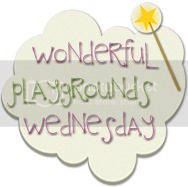 Also if you want to get in touch with me about helping you create a fully inclusive playground like Hadley's Park please feel free to contact me shelleykramm@gmail.com or on our facebook page. Shelley aka "the playground princess"
A few months ago I spent a wonderful weekend in Philly for Bloggy Boot Camp and I met a bunch of special women some of whose blogs I have been reading for some time. It was great to meet so many women with such diverse backgrounds who loved to share their stories. I particularly enjoyed meeting women whose lives were similar to mine, thus the introduction to Sunday.. This week marks the beginning of the holiday season. In the coming days many will celebrate Thanksgiving. In December families will come together for Hanukkah, Christmas, or Kwanzaa. Each holiday involves its own unique celebrations and customs influenced both by family and culture. In our home the holidays are influenced most by Autism. If you visit our home you will not find a large Christmas tree in the living room lovingly adorned with ornaments passed down from my mom's tree. There will be no lavish spread of food because the boys refuse to eat anything other than their normal day to day fare of grilled cheese sandwiches and homemade chocolate chip cookies. The fireplace is cold and still on Christmas Eve because setting one is too dangerous around the boys. Similarly, you will not find us loading up the car with presents and suitcases for a trek to share the joy of the holidays with our families. Because it seems autism is not something they want their holiday to include. Every year I go through the varopis stages of grief over the fact that my family chooses to not include my boys in their holiday plans. Why wouldn't grandparents want to spend the holidays with their grandchildren? Even if said grandchildren prefer playing with wrapping paper, long colorful ribbons, and loud obnoxious toys over sitting quietly in Grandma's lap while she reads them 'Twas the Night Before Christmas? Christmas is supposed to be about the children and celebrating with them the magic and beauty of the holidays. Why would grandparents and family choose to miss out on that? When the boys' grandparents choose to spend their holidays with their other grandchildren who do not have autism I am left feeling nothing but anger. In some ways I am comforted in knowing that the boys do not know nor care why their grandparents are not visiting with us. But I do, and it burns me up! In previous years I would bend over backwards to invite family to celebrate with us. I would plan out elaborate menus and wake up at 4 am to start the turkey in hopes of getting a couple hours in the kitchen before the boys woke up. Family would come, eat, stay maybe an hour and then leave immediately following dessert. I stopped trying to cater to their needs of my extended family after that. This stage seems to be where I spend most of my time during the holiday season. I mostly feel lonely and a bit sad for family and all they are missing out on when it comes to the boys and how quickly they are growing up. I miss my mom something fierce too. She was was the best damn Nana this world ever saw. She was also an amazing mother and friend. Before her death in 2004 you would find her spending every weekend, every holiday, and all her vacation time visiting her grandchildren and having fun with them. I mourn the fact that she is not here now to enjoy her grandsons like I know she would have wanted. Eventually (typically somewhere around December 24th) I make peace with the choices my family has made in how and with whom they choose to celebrate the holidays. I focus on making the most of Christmas with my amazing husband and the boys. Mike and I sip eggnog, play Christmas music much too loud (which the boys love! ), turn on the outside Christmas lights, break out the Scrabble board, and later we turn on The Grinch Who Stole Christmas and A Charlie Brown Christmas Special and we enjoy our grilled cheese sandwiches and chocolate chip cookies together. Just the way a family should at the holidays. Autism may mean my boys are different than most and that may mean that our holiday celebrations are a bit out of the ordinary as well. But, ours is no less filled with love, a sense of togetherness and magic. And if someone isn't up for celebrating the holidays with two boys who embrace those holidays full force and without abandon....then its nothing more than their loss. Sunday is the frazzled mom raising two boys on the severe end of the Autism spectrum while living to laugh and blog about it at Adventures in Extreme Parenthood. You can also find Sunday tweeting her Banshee heart out on Twitter at @ExtremeParnthood and on Facebook by searching for her name: Sunday Stilwell. It's back to school with ETSY! First I’d like to say I’m sorry I have been m.i.a for the most part this summer enjoying time with my family, but I’m back! It’s so hard to believe its back to school time! I have enjoyed looking around at some wonderful Etsy shops and hope you enjoy them too! 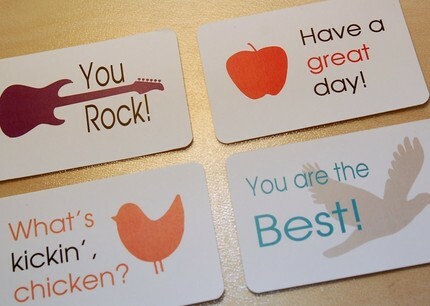 I always thought it was cute to send a little note in my daughter’s lunch, and now you can send the cutest notes with sweet thoughts, and I guarantee you your children will love them! 10 beautifully hand-wrapped #2 graphite pencils featuring bright pink and white plum blossoms, 5 on a pink background and 5 on a deep brown background. 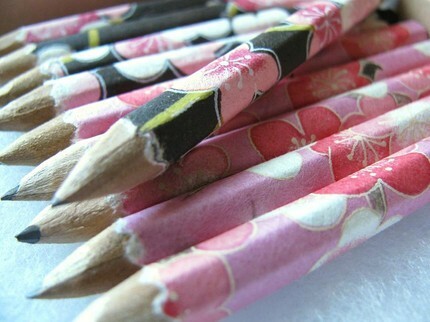 Each unique pencil is approximately 3.5 inches long (no eraser). Made with gorgeous, genuine Japanese washi paper. The pencils come packaged in a gift box, and include a gift tag for easy giving. 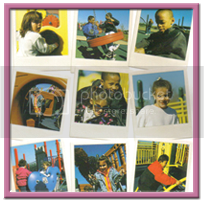 This set is perfect for teachers, students, writers, artists, party favors for guests, and more! I used to hate mornings when I had to send a note to or money to school and I couldn’t find either paper or an envelope these notes solve that problem! Whether your little one was sick, late, or leaving early...you'll be able to let their teacher know. 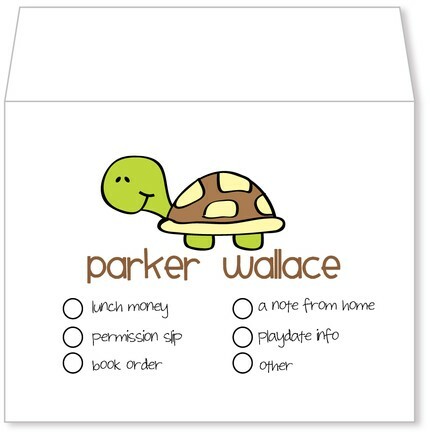 These school money envelopes are time saving must haves. 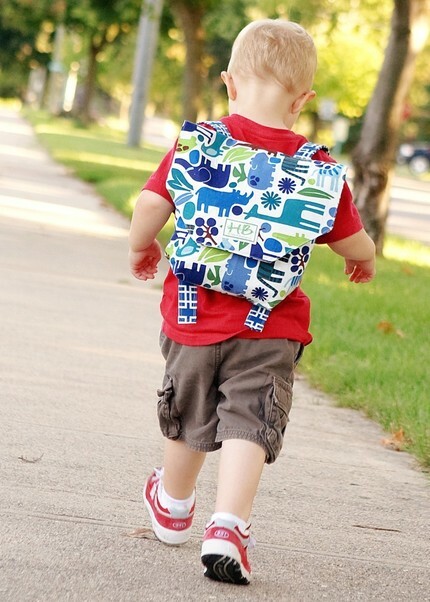 Check out this adorable “Pack Pack” as named by designer/mom after her inspiring 3 year old Carter (Toddlers back pack) Perfect for the little one in your life to carry around their own things to daycare or to the store! How about a super cute and eco-friendly solution to lunch time. 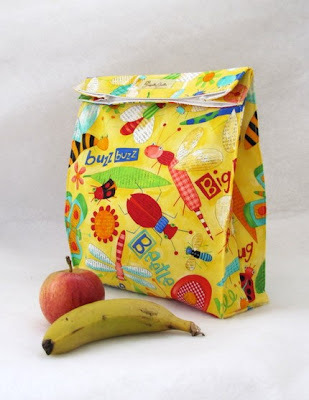 The Farfalla Gialla Lunch bag is made with cotton fabric, oilcloth and Velcro closure! This ornament would make a wonderful gift for your child's teacher, or is your mom a teacher, or dear friend, or are you a teacher and want to add this to your Christmas collection. The Perfect Place for Your Favorite Photos, Special Notes and Important Memos! 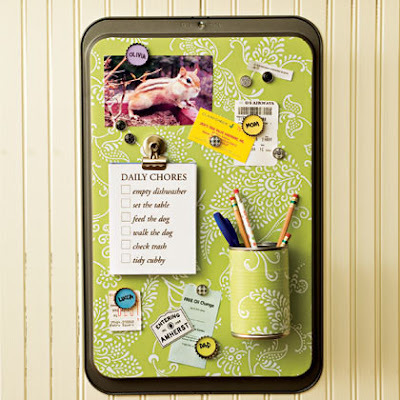 Handcrafted Magnetic Boards Featuring Interchangeable Magnets and Ribbons for Endless Design Possibilities... Perfect for that first day of school picture! 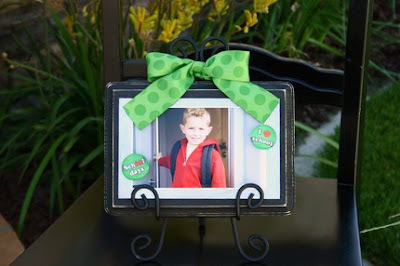 I hope this gives you some great back to school ideas for your family! 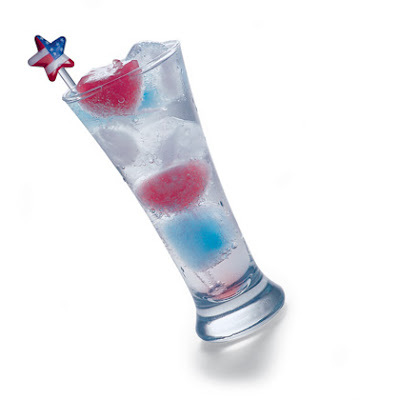 Fourth of July means, picnics, barbecues, pool or beach fun, enjoy the fireworks and just all around great family time. 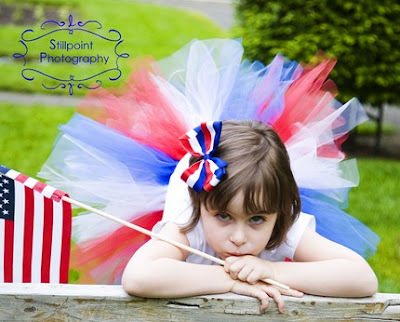 Here are some great ideas for things to do with your children to celebrate the fourth. 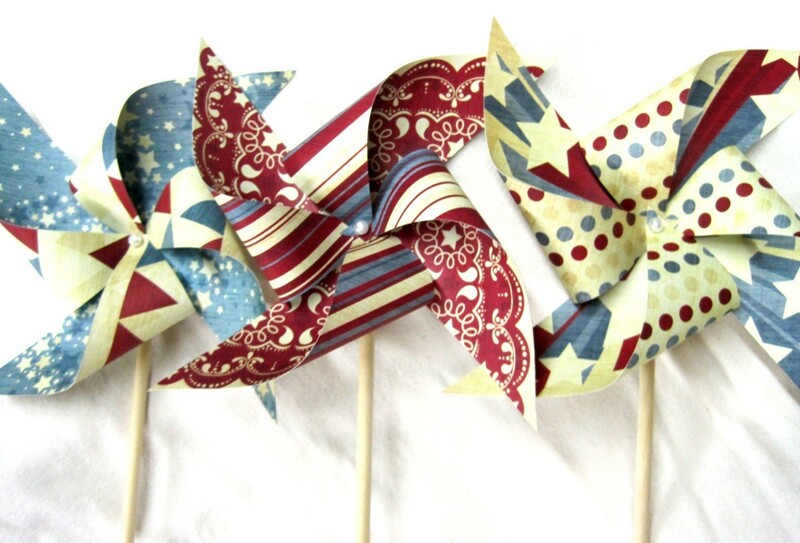 Every barbecue could use some great 4th of July napkin rings! 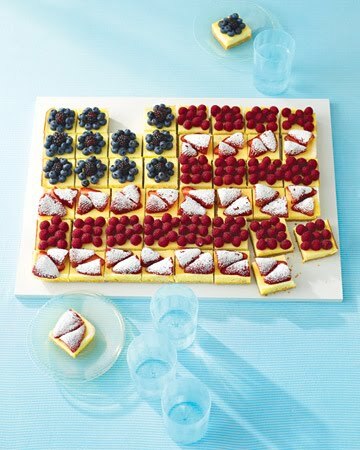 This is a great project for a patriotic holiday picnic. Have kids sit at the table and make the napkin rings while you man the barbecue grill! 1. 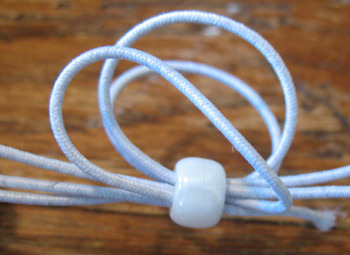 Thread one white pony bead onto a piece of elastic cord. Run the other two pieces of elastic cord through the bead as well. With all three elastic cords lined up evenly, thread them around and back through the bead a second time. 2. Pull ends to tighten so the beads don't fall off. You will remove this knot later. 3. Thread five red pony beads onto one of the elastic cords. 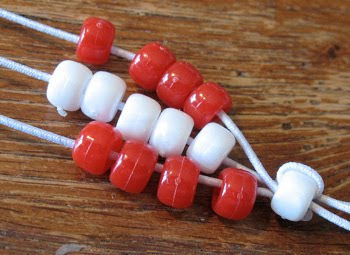 Thread four white pony beads onto the middle piece of elastic, and five red pony beads onto the last elastic cord. 4. Add two miniature white pony beads to the cord that has the red pony beads. Repeat for the other cord with red beads. 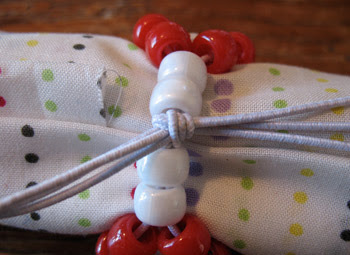 Add two miniature red pony beads to the cord with the white beads. 5. 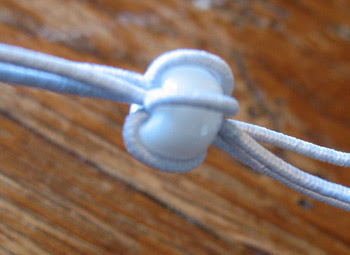 Add a blue star bead to each of the three elastic cords. 6. Next, reverse the pattern. Thread two miniature white beads, then five red regular beads. On the center cord, thread on two miniature red beads and four white beads. Finally, add two miniature white beads and five red beads to the last cord. 7. To complete, thread all 3 elastic cords through two white beads. 8. Carefully undo the temporary knot you created in step one. Add one more white bead. 9. Gather both ends of the cords together and tie them into a knot. 10. Thread a blue star bead on each end of the knot and loop the ends back through each bead as you did in step one. 11. Add some white glue to the holes of the blue star beads and let dry. 12. When dry, trim the ends of the elastic. 1. 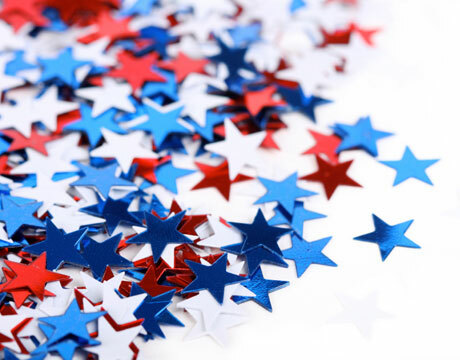 You can purchase specialty packs of "patriotic" colored beads that include everything needed here, including the miniature beads and the star beads. 2. 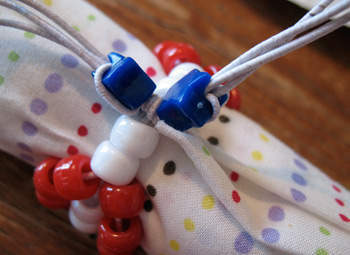 Convert this project into a bracelet by simply using longer pieces of elastic and more beads. 3. Elastic cord is available in the sewing department. 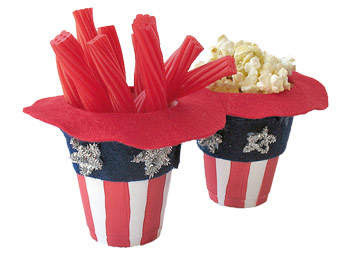 Another great decoration for your table this Fourth of July are these adorable treat holders made to look like Uncle Sam’s hat. Fill with your favorite treats and give away as party favors at the end of the party! 1. Place cup, open end down, on top of the red felt and trace with a marker. 2. Cut around the traced circle leaving a ¾” border around it. 3. Fold the circle and cut a slit in the center of the circle to allow your scissors to get in. Cut out the inside circle, leaving about a ¼” border around the inside of the trace line. Set felt circle aside. 4. Paint red stripes all the way around the outside of the cup, stripes should run up and down. Let dry completely. 5. Cut a strip of blue felt about 1.5” wide. It should be long enough to wrap around the brim of the cup. 6. Glue felt strip around the outside of the top of the cup. 7. Lay red felt circle on to work surface, black trace line should be facing up. 8. Line the lip of the cup with white glue and press down onto black trace line. Let dry. 9. Turn cup over and place on work surface. 10. Use silver chenille to bend into star shapes, trim where needed. 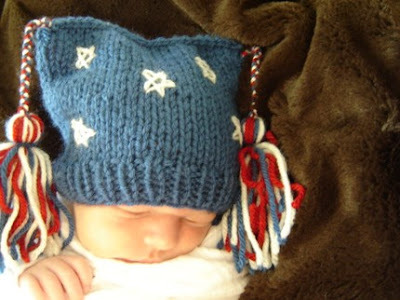 Glue onto the blue hat band. 11. When everything is dry, fill with treats. 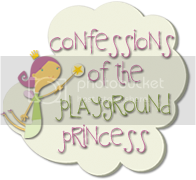 • To make our treat cups sturdier, especially if using outside, glue a heavy washer to the bottom of the cup. • You can add handles to your cup by twisting to chenille stems together and poking through the sides of the cup and running over the top. This step should be done before adding the blue brim. 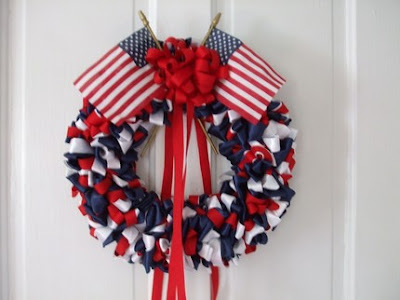 • You may also use white paper or plastic cups for this project. 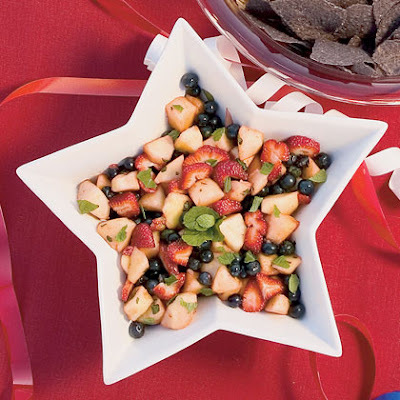 Tossed in fresh lime juice and garnished with mint, this combination of juicy strawberries, diced apples, and fresh blueberries makes a refreshing treat on its own. Spoon it over vanilla ice cream, and you've got an instant and irresistible dessert. 1. In a large bowl, whisk together the lime juice, honey, and mint. Add all of the fruit and toss to combine. Let the fruit salad set for 15 minutes to allow the flavors to blend. Serves about 8. This is heaven in a a dish! 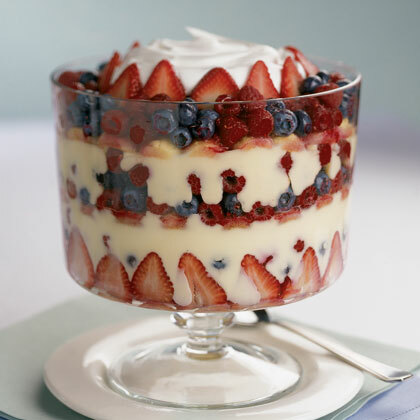 Serving this traditional English dessert in a glass pedestal bowl shows off its impressive layers of ladyfingers, pudding, and colorful fruits. If you don't have one, a regular glass bowl will also do the trick. 1. To make the fillings, prepare the pudding according to the package directions and chill it. 2. Slice the strawberries, if you're using them, then toss all of the berries with the lemon juice and the 1/4 cup of sugar. Set aside for 30 minutes to allow the berries to release their juices. 3. In a medium mixing bowl, whip the cream, vanilla extract, and remaining 2 tablespoons of sugar until soft peaks form. Set aside. 4. To make the layers, set a layer of ladyfingers (around 7 or 8) on the bottom of a large, clear serving bowl (ours was 4 quarts). Top with the berries with half of the pudding. 5. Add another layer of ladyfingers, another third of the berries and juice, and the rest of the pudding. Add a final layer of ladyfingers and berries. Top with the whipped cream and a berry garnish. 6. Refrigerate until you're ready to serve. Serves 8 to 10. 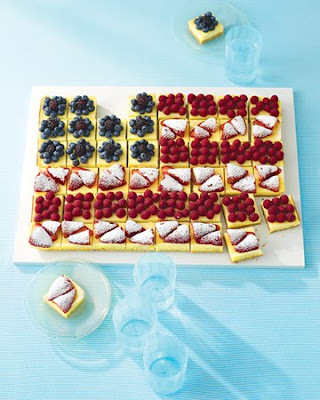 So how did you and yours celebrate the holiday? Hope it was great! Now go out and PLAY! Have kids online? Keep them safe! On May 27 Sarah and I attended the Wired Kids Summit in Washington DC. 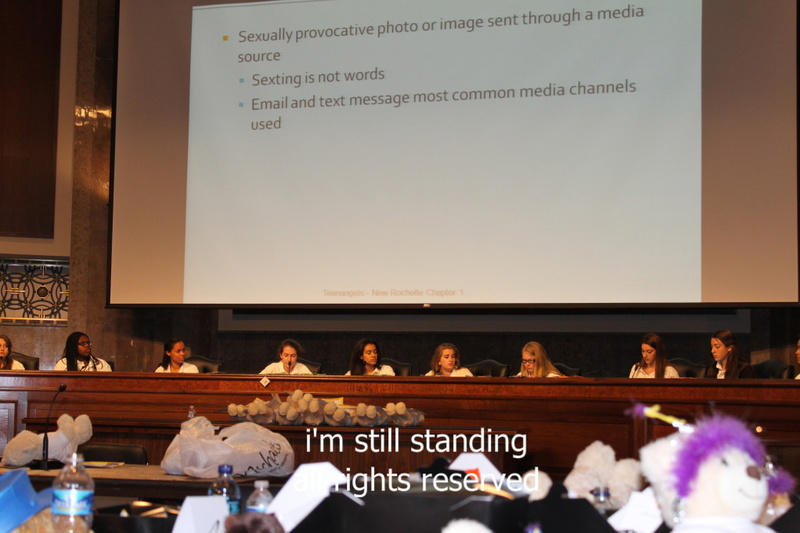 This was not the first meeting on Cybersafety that I attended, and with Sarah’s “run-in” with cyber bullying I knew she too would want to see what this was all about. The meeting was primarily a summit of Parry Aftab’s Teen angels to gather and talk to cyber companies and share their experiences i.e. facebook, Google, MySpace, Xbox, MTV, Disney, Nickelodeon etc. Teen angels are a group of thirteen to eighteen year old volunteers that have been specially trained in all aspects of online safety, privacy and security. After completion of the required training, the Teen angels run unique programs in schools to spread the word about responsible and safe surfing to other teens and younger kids, parents, and teachers. 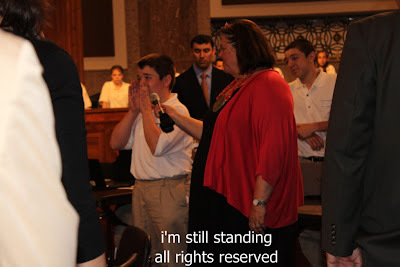 Parry and Teen Angel demonstrating the "Stop, Block and Tell"
Teen angels was founded in 1999 by leading cyberlawyer Parry Aftab, Executive Director of WiredSafety.org - the world's largest online safety and help organization and 501(c)(3) corporation. Parry personally trains most of the Teen angels! At the summit there were several panel discussions with the teens, the companies, and with the audience. 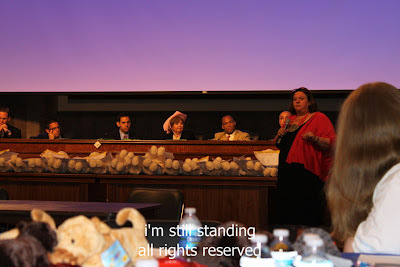 I had invited several mom bloggers to attend and other moms who are active in their schools so that they could learn from this and hopefully take back some ideas for starting a curriculum on the importance of internet safety and cyberbullying. At my last meeting I was blown away by the corporations that were showing support for this important venue. Two companies stood out big time to me and they were Build a Bear which is a store for younger children and teens who has devoted an entire section of their website to cybersafety and MTV who began a thin line campaign aimed at stopping the spread of abuse in the form of sexting, cyberbullying and digital dating abuse. psa courtesy of "A Thin Line"
I’m still not sure what facebook is doing to promote internet safety as well as gaming companies such as XBox. Facebook does have a place to report bullying but after my daughters experience I’m still a bit skeptical. A friend of mine who has 3 boys who came with me raised the question as to why should there be “chat” buttons on games such as scrabble where total strangers can hop on and start chatting with your child or you. She told me she finds this entirely too creepy and I have to agree. Keeping our kids safe has gone from our backyards into cyberspace and we really need to be wise. 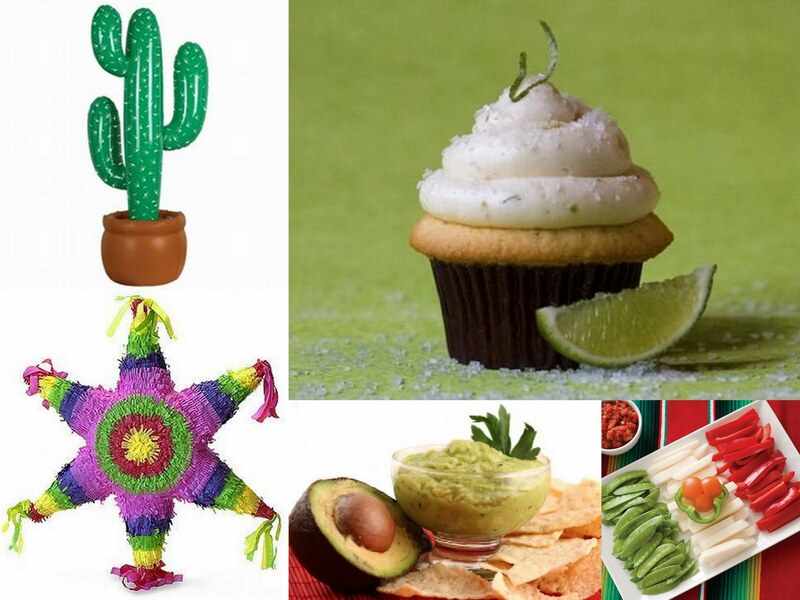 It's time for a Cinco de Mayo fiesta! So it’s almost that festive time of the year: Cinco de Mayo is a Mexican victory festival observed by Mexican-American communities and primarily in Puebla, Mexico. This day celebrates patriotism, unity and Mexican heritage. 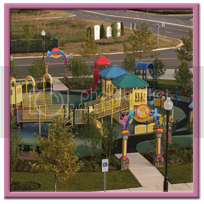 Why not have a little celebration with your kids, they will love it! Here are some of our family favorites! 1. Cut the avocados into halves and remove the seeds. Peel the fruit and place in a mixing bowl. Celebrate Cinco de Mayo and get your kids to eat their veggies with healthy crudités in the colors of the Mexican bandera nacional, or national flag. 1. Arrange pea pods, jicama sticks, and red pepper strips on a platter as shown, then center a green pepper ring and the bottom of an orange pepper on top. 2. Set out your snack with dips in the same festive colors: green guacamole, white ranch dressing, and red salsa. 10. Traditional pinatas are made in a pointed star shape and have colored crepe paper from the sides and bottom so feel free to add some colored crepe paper to your pinata. 12. Fill your pinata (through the hole you left at the top) with candy, toys, or any other fun surprises. In order to keep the prizes/candy inside from pooling in one area, also fill the pinata with leftover newspaper strips or crepe paper. 13. Your done! Now you need a good place to tie pinata and a stick and and a blindfold. 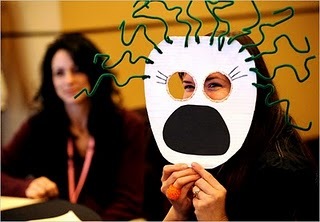 If you are an advanced pinata creator, use your imagination to create a fun design like a flower or an animal shape. Try using thick colored paper filled with scrunched up newspaper and glue or tape to add any details to your basic pinata structure. 1. Player stands behind the starting line and gets 3 large rings. 2. Player throws the rings at the cactus and needs to hook one of the arms to win. 3. If the player is not successful they go to the back of the line and lets someone else have a turn. How do you celebrate? Any ideas we'd love you to share them with us. 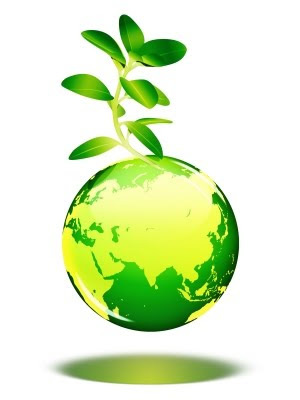 Tomorrow is Earth Day --and it's the 40th Anniversary of the holiday. It's a great time to learn about our planet and how to take care of it! Here are a few great ways to share this day with your children. This cute little egg carton buggy mobile is a time consuming project, but the results are well worth the time invested! 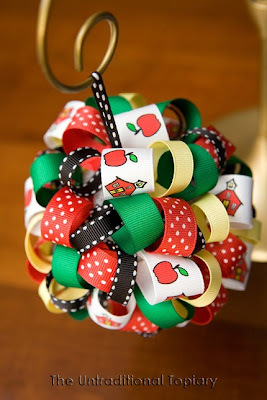 You can shorten the time of this craft by making it a group project. 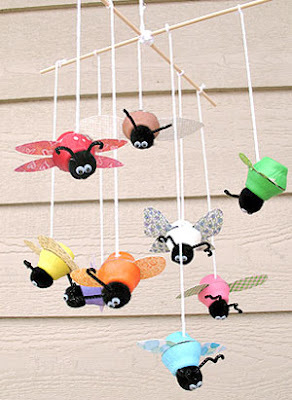 Let each child make one bug to hang on the mobile and it’ll come together in no time. 1. Remove the lid of the cardboard egg carton and save for another project. Place bottom of egg carton upside down and paint two sections with each color noted above (i.e. 2 red, 2 orange, 2 brown, etc). Repeat for a second coat and let dry. Spray all painted cups with acrylic sealer spray. 2. Cut the egg carton sections apart. Trim around the sections so that all you have left are colored cups. 3. If using patterned paper, most likely the backside of the paper is blank. If this is the case, fold the patterned paper in half, pattern on the outside. Put a layer of glue in between and stick together. This will create a piece of patterned paper that is patterned on both sides. If using construction paper this step is not necessary. 4. Cut leaf-shaped wings from the paper. 5. Separate the colored egg cups so that you have two groups of nine cups, one of each color. 6. Turn one group of colored cups over, set the other group aside. 7. Squeeze some white glue into each of the cups that are turned upward. Place a flat-backed marble into each cup and allow time for the glue to dry. This will give each bug enough weight that they will hang nicely on your mobile and will cut down on the lines tangling together. It will also help the bugs to “look” downward so that they are seen from the ground. 8. Cut 9 pieces of yarn about 18” long each. 9. Onto each of the egg cup halves with the marble in them, glue a black pom pom to the closed (bottom) end. Now pair up your colored egg cups. 10. To assemble each bug body you will need a pair of the same colored egg cups, a set of paper wings, an 18” piece of yarn and your hot glue gun. Pipe a layer of hot glue onto the outer open edge of the egg cup with the marble in it, place the wings onto the glue, the yarn in the middle of the open cup at the top, and then the other egg cup goes on last. Repeat these steps for each bug. 11. Now that the bodies are assembled you can glue the wiggle eyes onto the black pom poms. 12. Cut the black chenille stems into 2” pieces. 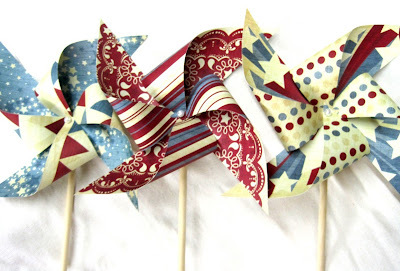 Bend the ends or twist them around a thin handled paintbrush. Put a dot of hot glue on the straight end and push into the top of the pom pom. Repeat for the other antenna. 13. Cut another piece of yarn about 12” in length. Crisscross the two dowels and wrap with yarn to secure, add a dot of glue to reinforce. Be sure there is enough yarn left over to tie a loop at the top to hang your mobile from. 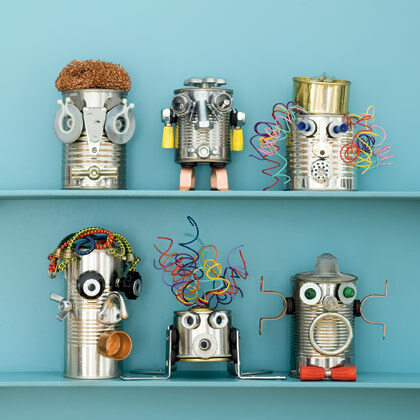 These friendly robots are more than just good-looking; magnets hold their features in place, making the 'bots the metallic equivalent of a Mr. Potato Head. • Hardware, and various recyclables such as bottle caps, keys, etc. 2. Empty, wash, and dry the can. 3. For facial features, arms, propulsion devices, and communication arrays, look for items around the house and at the hardware store. We used bolts, brackets, hinges, keys, wing nuts, switches, bottle caps, washers, knobs, and more. 4. Hot-glue the items to strong disk magnets. 1. Cut off top of cereal box. Halfway across top of box, cut at a 45 degree angle down to front of your magazine holder, cut straight across then back up other side at the same angle. 2. Lightly sandpaper outside of cereal box. (They are usually shiny, coated paper.) Alternatively you can paint a layer of gesso all over the box. Either one of these methods will help the paint adhere to the box. 3. Spray paint the box white, or paint on with inexpensive sponge brush. Let dry. 4. Cut out leaf shape from sponge or use a leaf shaped foam stamp. 5. Pour out small amount of green paints. 6. 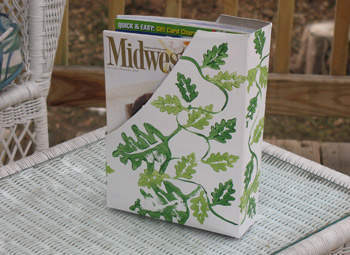 Use thin paint brush to add a swirled line all over the box, this is the vine. 7. Sponge paint (or use foam stamp) green leaves on front of box leading to sides of box. First the darker, for background leaves, then lighter for foreground leaves. 8. If painting more than one box, try to connect vines on each box so when set together they will match. Get the message across with a repurposed cookie sheet. 1. Measure the back of your cookie sheet and cut a piece of shelf liner that's an inch wider and an inch taller. Stick the shelf liner to the back of the cookie sheet by peeling off one corner of the liner and laying it down on a corner of the cookie sheet. Slowly pull the backing away as you smooth the liner onto the sheet. Cut off the excess shelf liner. 2. To make a hole for hanging, place the cookie sheet over a piece of scrap wood and use a hammer to punch a nail through the center of the rim. 3. For the pencil holder, cut a piece of shelf liner that's about an inch taller than the can. Wrap the liner around the can so that the ends overlap a bit, then cut off the excess liner. Glue two magnets to the side of the can. 4. For the bottle-cap magnets, glue a magnet inside of each cap. Cut a piece of card stock to fit the cap, write a name on it, and glue it on top of the magnet. Chocolate: Africa's Ivory Coast is the largest producer of cocoa beans, the ingredient that gives chocolate its unique, irresistible flavor. Coconut: The Philippines and Indonesia are the world's leading producers of copra, or coconut meat. 1. Heat the oven to 350 degrees. 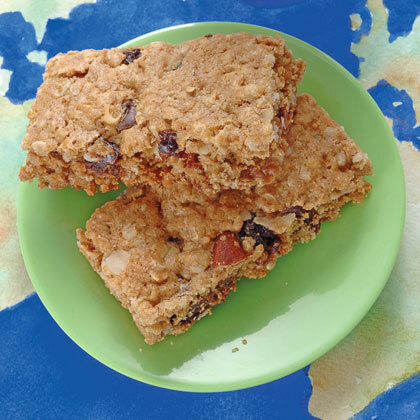 In a large mixing bowl, combine the baking mix, oats, brown sugar, butter, egg, and cinnamon. 2. Stir the mix with a wooden spoon until you have a crumbly dough. Next, customize your international treats by folding in 1 cup total of the add-ins of your choice. Remember getting kids into the garden is a great way to introduce them to green living! How are you going to spend your Earth Day?